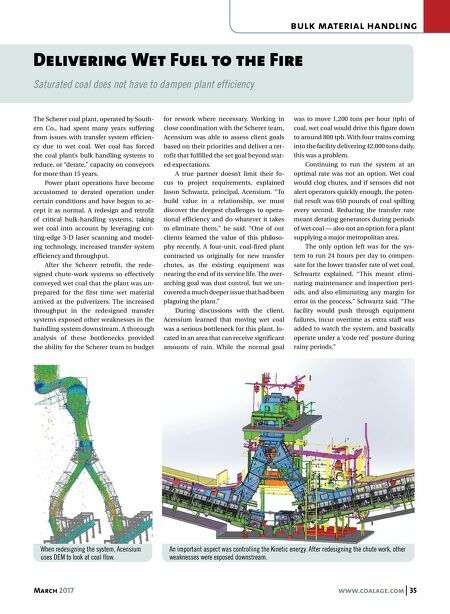 34 www.coalage.com March 2017 roofbolting continued The Need for a Remote Dual-Boom Roof Drill The current market in South Africa is flooded with "Man in Position" roof bolters. There are currently mre than 200 of these roof bolters in South Af- rica, with the bulk of the machines being twin-boom units. When operated correctly, these machines are safe, versatile, reliable and productive. How- ever, with operators located close to the drilling and bolting operations, they can be exposed to operational hazards. These hazards are from a variety of reasons, as roof drilling and bolt installation is labor intensive and repetitive. The job requirements can often lead to cumulative trauma. Operators are expected to perform a con- siderable amount of lifting, carrying, bending, reaching and stretching. This includes bending and twisting to install bolts or lift and position drill steels, wrenches and bolts. Confined operator spaces can also contribute to difficult and awkward working positions. With "Man in Position" style machines, the operator is in close proxim- ity to where the drilling and bolting process is performed. When proper op- erational procedures are followed, it has been proven to be a very effective, productive and safe system. The Mine Safety and Health Administration (MSHA)-certified ATRS, canopies and dust collection system of Fletcher bolters all provide the operator with unparalleled protection. However, there are some occupational hazards inherent to the zone located next to the drilling and bolting zone. This has led some customers to request relo- cating the operator away from this zone. The idea being that the operators will no longer be located in the face area, greatly reducing their exposure to dust, noise, machine and geological hazards. This resulted in J.H. Fletcher & Co. teaming with a South African cus- tomer to develop a new roof bolter that would alleviate exposure to many of these potential hazards, while still maintaining current production rates. From this, a new Fletcher model CHDDR-AC remote bolter was born. The crawler driven machine is fitted with a fork lift-loaded material pod, along with a rear lifting ramp to provide easier access to the back of the machine. The machine features large walkways paired with ergonomic operators' compartments. A walkway was provided on the front of the machine to allow loading of the bolt carousels without having to step off of the machine. A hydraulic actuated, MSHA-certified canopy covers each operator's compartment. The two independent canopies help with trans- porting the bolts from the material pod to the bolt carousel when reload- ing. The design was specifically targeted to alleviate some of the material handling burdens imposed on a roof bolter operator. The bolt module for the CHDDR-AC implemented a dual mast design. Each mast is equipped with individual crowds to reduce the roof profile of the mast. One mast is dedicated to drilling the hole and inserting the resin while the other mast is dedicated to installing a bolt. The dual mast design eliminates the need to stow and manipulate the drill steel providing the ability to rib bolt. The resin is inserted using pneumatics. The resin inserter is fixed to the drill mast assembly and uses the same roof reference guide as the drill steel. This eliminates the potential for misalignment providing reliable resin insertion. The bolt carousel is equipped for a capacity of 16 bolts. Several bolts can be loaded in the carousel from one position, meaning the carousel does not need to be rotated after inserting only one bolt. The new design uses all purely hydraulic controls with manually actu- ated handles. This provides a machine that is reliable and easy to trouble- shoot and maintain. Even though the controls are fairly simple, there are still advancements incorporated. There is a latched drilling feature, which aids in reducing overall drill/bolt cycle times. There is also a feed force se- lector valve that allows the operator to choose one of three settings: high, medium or low. This is helpful in combating the many different roof condi- tions encountered in a coal mine. The machine is also equipped with a hy- draulic resin timer. Once the operator has installed the bolt, they will turn on the resin timer. The resin timer will spin the bolt for a preset amount of time. After this mixing process, the machine automatically torques the bolt to a preset torque. All of these added features help the operator perform his/her job in a more efficient manner. Through this project, Fletcher has showcased its ability to custom en- gineer solutions for customers. 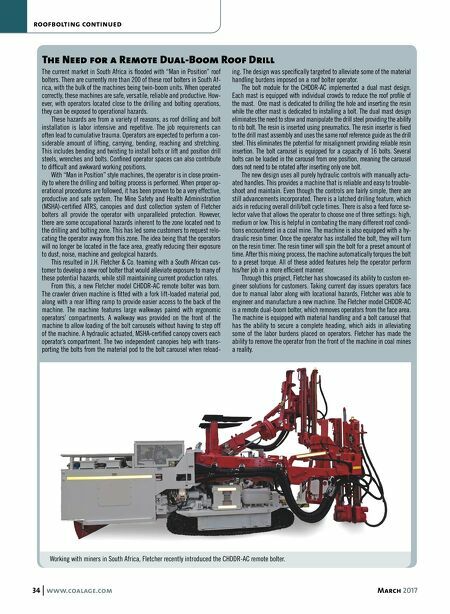 Taking current day issues operators face due to manual labor along with locational hazards, Fletcher was able to engineer and manufacture a new machine. The Fletcher model CHDDR-AC is a remote dual-boom bolter, which removes operators from the face area. The machine is equipped with material handling and a bolt carousel that has the ability to secure a complete heading, which aids in alleviating some of the labor burdens placed on operators. Fletcher has made the ability to remove the operator from the front of the machine in coal mines a reality. Working with miners in South Africa, Fletcher recently introduced the CHDDR-AC remote bolter.